Lavish displays fete the Year of the Sheep. 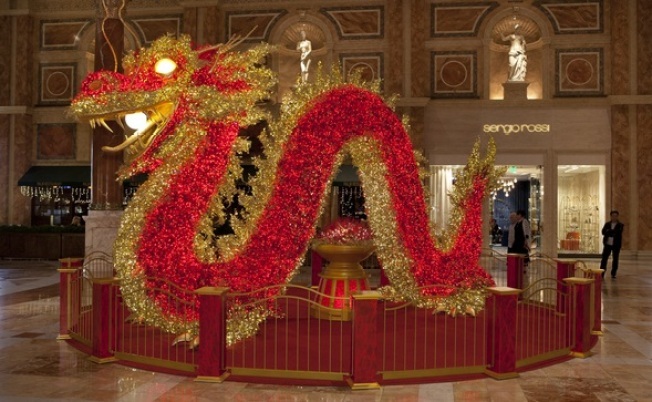 A 22-foot-long dragon greets visitors to The Forum Shops at Caesars Palace in honor of the Lunar New Year. THE FORUM SHOPS AT CAESARS PALACE: A dragon symbolizing "power, strength, and good luck" can be found on the Fortuna Terrace. But this is no mere dragon: The "massive, 950-lb. dragon is covered in 30,000 red and amber LED lights, many of which flicker, giving the vibrant beast a vibrant look and dynamic feel." The majestic creature is 22 feet in length, six feet wide, and some 12 feet tall. There's a party in the dragon's honor, too, ahead: Students from a local school will "perform the traditional dragon parade throughout The Forum Shops" on Feb. 19 starting at 10 a.m.
BELLAGIO CONSERVATORY & BOTANICAL GARDENS: A 14-foot-tall "grassy mountain," incense diffusers, I-Ching coins, and some 22,000 flowers in shades of red and gold fill the glass-roofed nature space. The Year of the Yang is at the heart of the leafy, petal-filled display, which includes a traditional home complete with jade doorknobs, five animated goats, a 21-foot-tall lantern, and a pond full of Koi fish. While goats are the stars of the Bellagio display, look for rams to receive their Lunar New Year due "elsewhere around the resort."